William Blake did so much so well that it is difficult to label him. Therefore, we're going to let bookseller and William Blake expert John Windle summarise the incredible life and impact of this particular Englishman. "Blake is regarded as one of the greatest polymaths who ever lived: poet, songster, artist, printmaker, etcher and engraver, philosopher, and genius. He single-handedly created the first 'livres d'artiste' in his series of illuminated books in which text and artwork are inextricably entwined, starting a tradition in England that continues to this day. "He changed the course of literary history in how he wrote poetic songs for children. He was a political radical who championed unpopular causes and was once almost executed for his beliefs. He was famously an occasional nudist who on a sunny day might be found naked as a jaybird in his garden singing away with (his wife) Catherine; profoundly spiritual but utterly opposed to organized religion; and a firm believer in the expression of natural sexuality free from repression, guilt, or shame. As someone born and brought up in England, Blake, for me, is always remembered for Tyger, Tyger, a poem most British people encounter at an early age. And then there's Jerusalem. I've heard that song/hymn/anthem, which uses Blake's words, belted out at political rallies, sporting events, Women's Institute conferences and by numerous rock stars. I didn't learn about his art until joining AbeBooks in 2005. John Windle's exposure to Blake (1757-1827) is considerably deeper. His interest began in 1967 when he was working for London book dealer Bernard Quaritch, who represented the Blake Trust/Trianon Press. 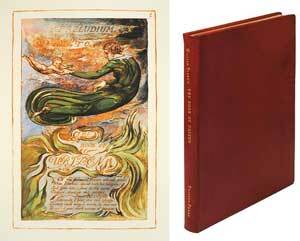 (The William Blake Trust established Trianon Press with the intention of creating faithful reproductions Blake's works, and issued facsimiles throughout the 1950s and 1960s.) 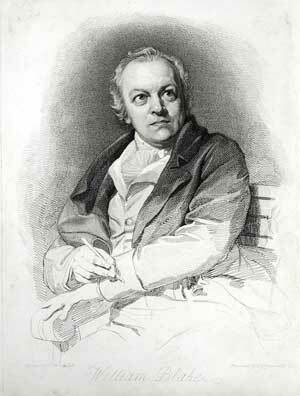 After dealing for many years in Blake's books and art, Windle opened an art gallery in San Francisco dedicated solely to William Blake. John was kind enough to answer our questions. 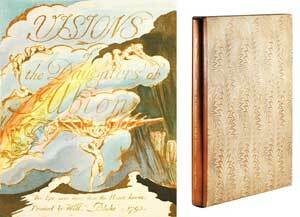 AbeBooks: Why open an art gallery dedicated to William Blake? John Windle: "Blake opened one and failed to sell a single painting. I thought I'd try. We sold a painting right away, and more recently a pencil drawing, as well as several prints priced from $275 to $15,000. The overhead for the gallery is already covered for the next five years (when our lease expires) and it's a great way to let people experience Blake in all his variety free of charge. And if Mark Zuckerberg wanders in, so much the better. "Today his paintings and color prints sell in the millions of dollars. The color print 'The Good and Evil Angels' sold a few years ago for over $3 million, an illuminated book The Book of Urizen sold for $2.5 million, and even a brief receipt to Thomas Butts for payment for a copy of the Songs of Innocence and of Experience (the copy which is now at the Huntington Library in Los Angeles) signed by Blake sold for $45,000." Tyger Tyger, burning bright, / In the forests of the night; / What immortal hand or eye, / Could frame thy fearful symmetry? AbeBooks: What do you believe is Blake's finest body of work? John Windle: "It depends on which body of work. Poetry, original art, prints, philosophy. Poetry is the most accessible and the 'Songs of Innocence and of Experience' are the best known. 'Songs', now considered to be the foundation volume for the romantic movement, was hand-printed, colored, and bound by Blake and his wife, and sold one by one to friends and friends of friends - fewer than 40 copies were sold during his life, even though Blake continued producing them sporadically up to about 1818. And there's the Poetical Sketches, printed for him by a friend, only 24 copies are extant today. These homemade humble little productions changed our world." AbeBooks: Where does Blake's poetry stand when compared the other great names in British poetry? John Windle: "He is the most quoted and most anthologized poet in the English language - just Tyger Tyger and Jerusalem are better known and more quoted than anything by Shakespeare, Milton, Donne etc. At Kate and Will's wedding, watched by 2 billion, they sang Jerusalem. At the opening of the London Olympics, watched by almost 1.2 billion, they sang Jerusalem. It's become the national anthem of the UK and colonies worldwide." 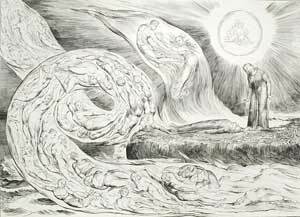 AbeBooks: Some of Blake's works are priced in three figures - where would someone start if they wished to begin collecting William Blake on a budget? John Windle: "Again it depends what they want to collect. Poetry begins at $10 or less and there are hundreds of editions to chase down. Prints can be had from $200 or so up to tens or even hundreds of thousands. Artwork runs from a low of $20,000 or so for a minor pencil sketch into millions for major pieces, and original illuminated books start in the low millions." 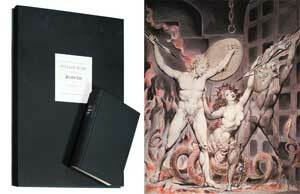 AbeBooks: Blake claimed to have visions - do you believe he was insane or just his own man? John Windle: "There are many opinions on this from professional mental health experts to pop psychologists - no one agrees (it depends largely on the definition of insane) but what's very clear is Blake had visions from early childhood until the day he died and they were as clear to him as the 'real world' the rest of us live in." 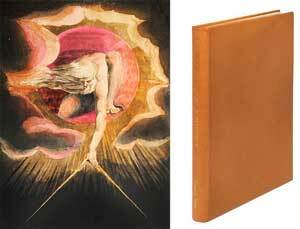 AbeBooks: It appears that Blake's influence on culture continues to be significant. Is this a fair assessment? John Windle: "Yes, he's the best known figure in British art, literature, and philosophy combined and is always ranked amongst the greatest artists England ever produced. His words have been set to music by over 1,400 classical composers, most famously Benjamin Britten, Ralph Vaughan Williams, and Sir Hubert Parry. In popular and folk music, it is hard to name a musician who doesn't reference Blake in one way or another but a random selection would include Martha Redbone, Bob Dylan, Patti Smith, U2, The Doors (who took their name from Blake), Van Morrison, Tangerine Dreams, and my favorite, Jah Wobble - who hasn't sung along to his immortal version of The Tyger?" 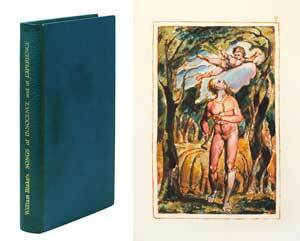 AbeBooks: If we could only read one book about William Blake, what book should it be? John Windle: "I usually recommend the biography by Peter Ackroyd as it is by far the most readable, with scholarship that's accurate. Blake is so constantly written about and studied from every possible perspective that some academics have jokingly referred to 'the Blake industry'. The standard reference work on writings about Blake cites 17,139 titles up to 2012, written in 44 languages including Esperanto, Farsi, Gaelic, Indonesian, Japanese, Mazahua, Turkish, Welsh, and Yiddish. Dozens more appear every year and currently Blake is enjoying exceptional popularity in China, Japan, Russia, Israel, Spain, Germany, and France." Visit John Windle's William Blake Gallery at 49 Geary Street, Suite 233, San Francisco. CA 94108. Open Tuesday through Saturday from 11am to 5pm, calling ahead is advised (415) 986-5826. A large folio print from Dante's Inferno when Agnolo Brunelleschi is attacked by a six-footed serpent. published by Trianon Press in 1958, with 27 plates and limited to 526 copies. Published by Trianon Press in 1955 with 54 color plates and limited to 15 copies. 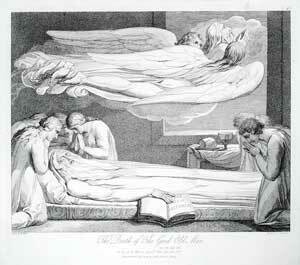 The Death of the Good Old Man, a single plate from The Grave, 1808. Published by Trianon Press in 1969 with 17 color plates and limited to 26 copies. 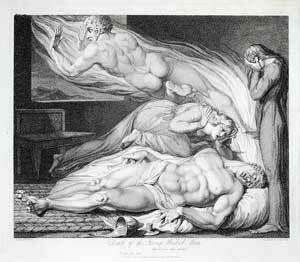 The Death of the Strong Wicked Man, a single plate from The Grave, 1808. Published by Arion Press in two volumes in 2002 and 2004, limited to 400 sets. Blake's watercolors are produced at full scale in color facsimile from the originals in the Huntington Library. Published by Trianon Press in 1959 with 11 plates and limited to 426 copies. 1. Born in London, Blake attended school until he was 10 and was then educated at home by his mother. 2. At the age of 14, he began a seven-year apprenticeship as an engraver. 3. Blake married Catherine in 1782 in Battersea. She was illiterate, signing her wedding contract with an X. He later taught her to read and write. 4. Blake's first collection of poems, Poetical Sketches, was printed around 1783. Only 40 copies were printed. 5. Blake claimed to have numerous visions, causing many of his contemporaries and biographers to describe him as insane. 6. The Tyger poem was published in 1794 in Songs of Experience. The first stanza is Tyger Tyger, burning bright, / In the forests of the night; / What immortal hand or eye, / Could frame thy fearful symmetry? "And did those feet in ancient time" is a short poem by Blake. It's now best known as the words for Hubert Parry's 'Jerusalem' song. The poem contains several phrases that have become famous in their own right - dark satanic mills, bow of burning gold, arrows of desire, chariot of fire, and England's green and pleasant land. 7. Blake was deeply opposed to the organised religion of his day. He saw mainstream religion as a repressive force, particularly in sexuality. 8. Blake's 22 engravings for the Book of Job, which he completed in 1826, are considered by some to be his finest. 9. 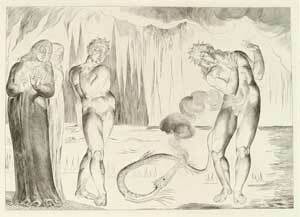 Blake was producing engravings for Dante's Divine Comedy when he died in 1827. 10. Blake is buried in Bunhill Fields in Islington, London, but the exact location is unknown as many gravestones have been removed. Have you read William Blake's poetry?